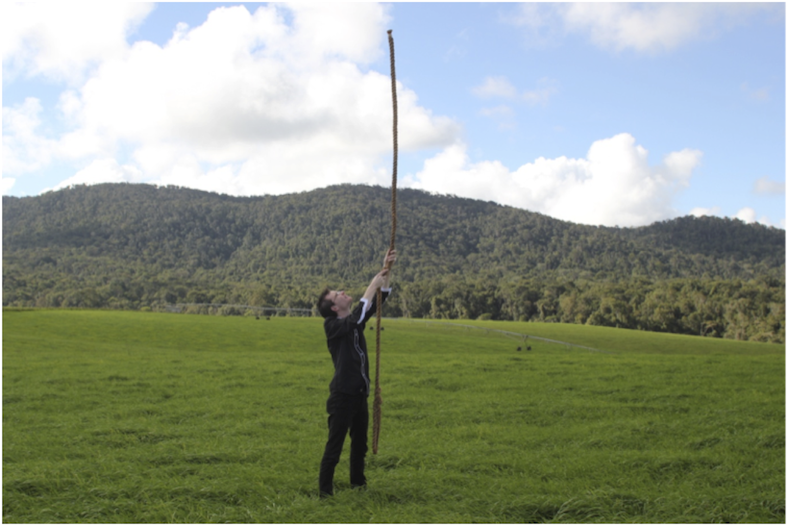 Australian magician, Joel Howlett, usually raises his rope in a large, open paddock, well away from any trees or buildings. 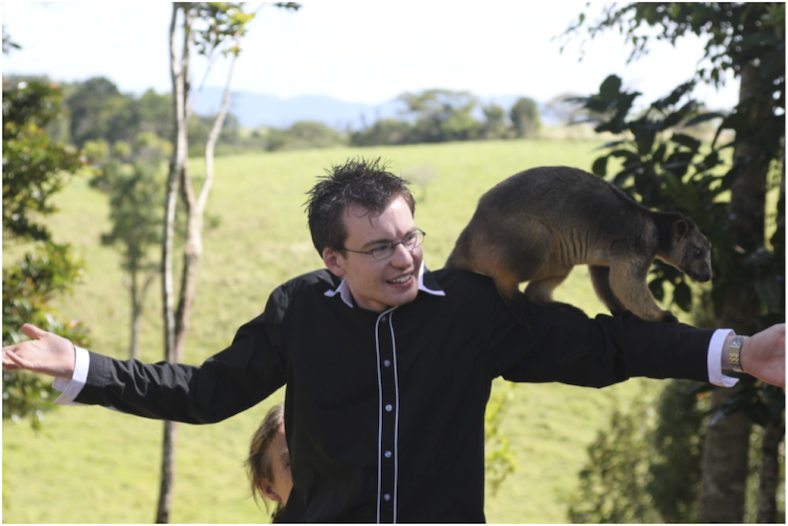 Joel meets Zoe, a rare Lumholtz Tree Kangaroo. 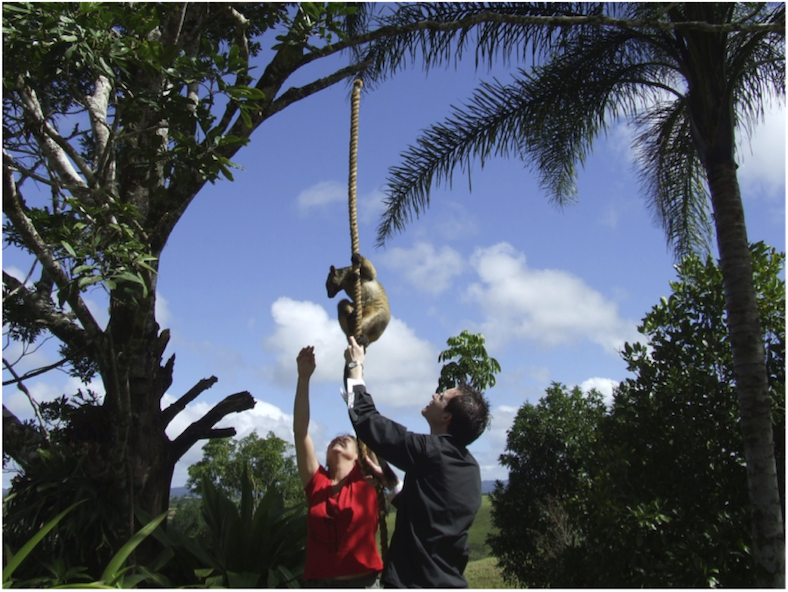 Zoe, orphaned and rescued, was hand-raised by Dr Karen Coombes, Director of the Tree Roo Rescue and Conservation Centre, Malanda, Queensland. To Zoe, Karen is her Mum. Karen introduces Zoe to Joel’s rope. Zoe is quite used to climbing a rope. Her own rope can be seen in the background, draped over a branch of her favourite tree. 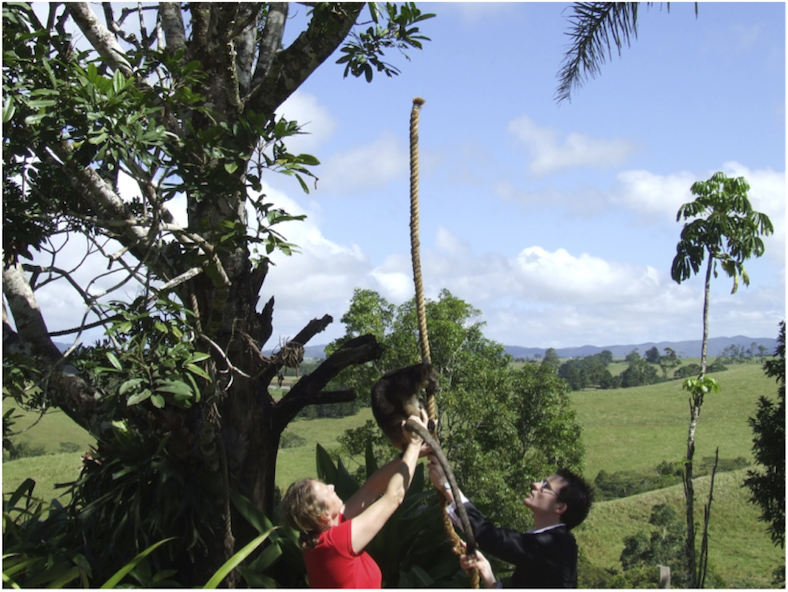 By erecting the magician’s rope under Zoe’s favourite tree, Joel and Karen have ensured that Zoe understands she is being invited to climb. Joel’s rope is not attached to the tree in any way, and these images are not photo-shopped. Up goes Zoe! Climbing comes naturally to these beautiful creatures. This promotion is the latest episode in the history of a remarkable feat of magic. 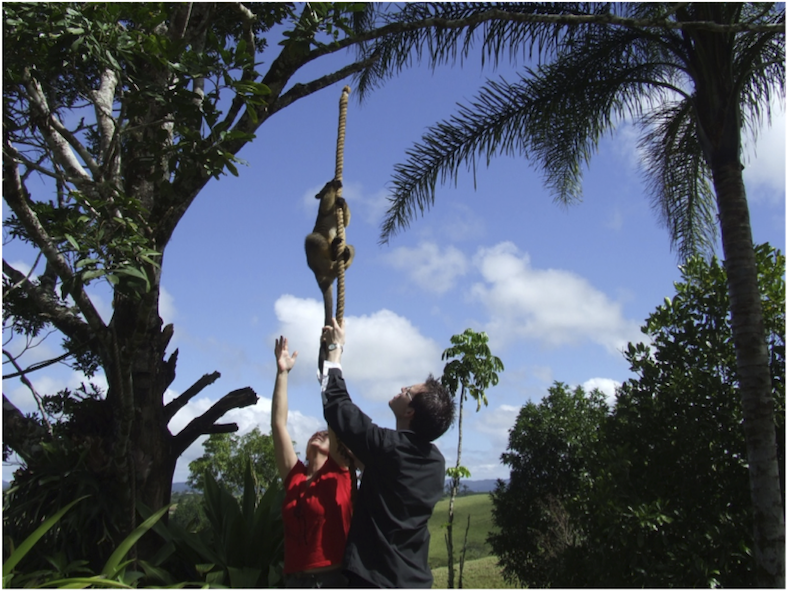 Just as a tree-climbing kangaroo is sometimes said to be a myth, the Indian rope trick has been called a myth also. It is not. The true history of this centuries-old mystery has been greatly distorted over the past 100 years. These revealing documents, many translated from 19th century French originals, uncover the real personality of the celebrated prophetess, and expose her devious methods of predicting the future. This is fascinating. I enjoyed reading Lamon’ts book, but recall feeling as if the conclusions were a bit specious. Your line-by-line analysis is very interesting and excitens this debate! Thanks Joseph, your comment is greatly appreciated. Sorry for the long delay in replying, but I have been working hard on more material for this website! Thanks Sreekanth, it’s good to see Indian magicians are taking an interest in this website. I do not want the site to be inundated with magicians’ addresses, so I have withheld your contact details, but anyone who wishes to contact you can obtain your details from me, and learn from you what really happened at Udupi! Very happy to find your website, Jim. I share your interests in magical effects, and in Hindu and Buddhist philosophy. I agree with you that the Suruci Jātaka and Śankara accounts are important classical sources for the feat where a man or boy appears to climb up a rope and then vanish. Maybe it is a genuine illusion or maybe it is a legend (I mean the vanishing part), but either way it’s a creation of the east not the west. I also agree that if acts like this really were performed in past centuries, then misdirection would have been an important part of the method. Śankara says that while the image of the performer is up on the rope, the performer himself remains on the ground. This description is consistent with the theory credited to the magician Maskelyne (by Herbert Giles, translator of a Chinese narrative about the illusion), that the trick was done using mirrors. Either by using a concave mirror (as Maskelyne thought), or perhaps by means of the Pepper’s Ghost technique, with a mirror that is partially transparent. Such a device could make the performer’s image appear near the top of the rope, while the performer himself was in a hidden chamber on (or just below) the ground. A mirror-based illusion might be too elaborate and expensive for Indian street performers today. However, in past centuries there were not only street entertainers but entertainers at royal courts too. The Suruci Jātaka passage which you quoted mentions that the illusion was performed for the amusement of a prince. The Suruci Jātaka mentions a “great mango tree” to which the rope became attached. A mirror could have been set up among the branches of the tree. Even without a tree, if the illusion was performed in a courtyard, threads of strong thin material (silk?) could have been hung high up from one wall to another, and a mirror (as well as the rope) could have been suspended from the silk. In Melton’s account, the performers do a series of acts involving poles before they get to the rope trick. He doesn’t tell us what they did with those poles after they used them, and apparently didn’t consider whether the poles played some part in the rope trick… But if the poles ended up standing in the ground, or being held vertically by members of the troupe, perhaps they could have served as a scaffold for something? I doubt whether use of mirrors would enable the reflected image to climb steadily from the surface of the ground to the top of the rope. But that is where misdirection and suggestion would fill the gap. E.g. * A performer plays ineffectually at climbing the rope, looks like comic relief. * When the audience looks back at the rope, the first performer appears to be near the top. Of course they suppose he got there by climbing quickly. How else? The next step — making the climber at the top of the rope vanish — would not be difficult to arrange. Making someone vanish from somewhere is easiest when they have actually been somewhere else all the time. Thanks, Colin, for your interesting comments. I agree that the disappearance of the climber could be produced, and indeed has been produced, by optical illusion using a mirror, or masking, or by what is known as “black art” or “black theatre.” But such performances inevitably require a stage or set piece with the spectators confined to a certain area so that their sightlines do not expose the method. If we are to believe the many eyewitness reports from the 19th and early 20th centuries, the performers were itinerant street workers often completely surrounded by the audience. My personal opinion is that the method I describe in “Indian Rope” and “Translating Melton” is the most practical and believable method available to a poor, wandering troupe; I think this method is very old; and I think that when Shankara wrote of an illusory juggler in the air he was referring to the auditory illusion produced by ventriloquism and not an optical illusion produced by a mirror. Of course, all this is debatable, and I do not doubt that magicians will continue to debate it far into the future! Thanks, John, for getting in touch and for your kind words about this site. Interesting topic you’ve chosen for enquiry. If anyone out there can assist John, contact him direct. But please, folks, don’t bombard him with marketing spam – he is trying to do serious research. John, I have just unsuccessfully spent half the morning trying to find for you the name of an Indian scholar (foolishly, I did not note down his name earlier!) who made an interesting claim. He referred to those British magicians who wrote in the early 20th century about Indian magicians and criticized them for their ill-fitting western suits and crude mimicking of western tricks. This scholar claimed that these writers were unaware that the Indian performers were engaging in satire, in burlesque, that the Brits (mostly army men such as Major L Branson) just didn’t get it! This intrigues me. Is this just the understandable desire of a modern day Indian writer to restore the image of the Indian magicians of yesteryear? Or is this scholar’s claim true? Perhaps you can discover the truth. Good luck with your research, John, wherever it takes you, and let us know when you publish the results of your work. I’ve been looking further at some of the literature about the Indian rope trick, and I noticed that John Nevil Maskelyne actually describes a method based on misdirection (plus a gimmicked rope) in his 1912 book “The Fraud of Modern Theosophy Exposed”. Methods like that may indeed be behind some of the 19th and 20th century reports of the trick. But I’ve also been looking at earlier reports of the rope trick, e.g. Ibn Battuta and Emperor Jahangir, which imply a more elaborate method, involving concave mirrors, as suggested by the same J.N.Maskelyne in 1878, in an article in Leisure Hour. Jahangir mentions that the same Bengali performers who demonstrated animals vanishing in mid-air, on another occasion showed a large mirror which shone with extraordinary brightness in the middle of the night. Establishing that they had a mirror (presumably concave, since they concentrate light), and also a good strong light source. Maybe pyrotechnics, invented in China about the 9th century. Regarding spectators’ sight-lines, I agree that would be a crucial point if they were looking directly at a mirror. But wouldn’t it be less crucial in a system where the concave mirror projects an image to a screen (which concave mirrors can do) and the spectators are looking at the screen? It links to your translation of Edward Melton, and also to your review of Peter Lamont’s book. Thanks, Colin. Colin has some interesting ideas here, but I must confess that the few experiments I made many years ago with a concave mirror were very disappointing. Does anyone out there have practical experience in using a concave mirror for illusion purposes?